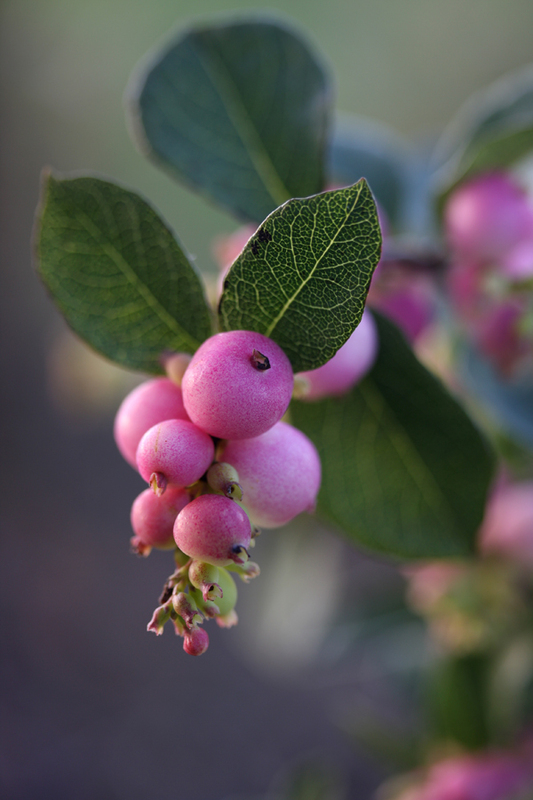 Autumn brings some wonderful opportunities for colour from berries foliage and flowers. There are lots of traditional choices that we look at every year. Here a few you might not have thought of. Symphoricapos is usually used as a hedging plant and the berries that follow the white blossom are white. Here we have a luscious pink berry. Its deciduous and quiet and vigorous plant that grows quiet dense ideal for hedge. Its not a favourite flavour of the birds so the berries tend to last a long time. 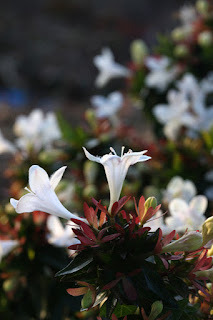 Abelia is always a delicate delight this time of year. Its a medium sized evergreen shrub. Always covered in a mass of little bell flowers late summer autumn. 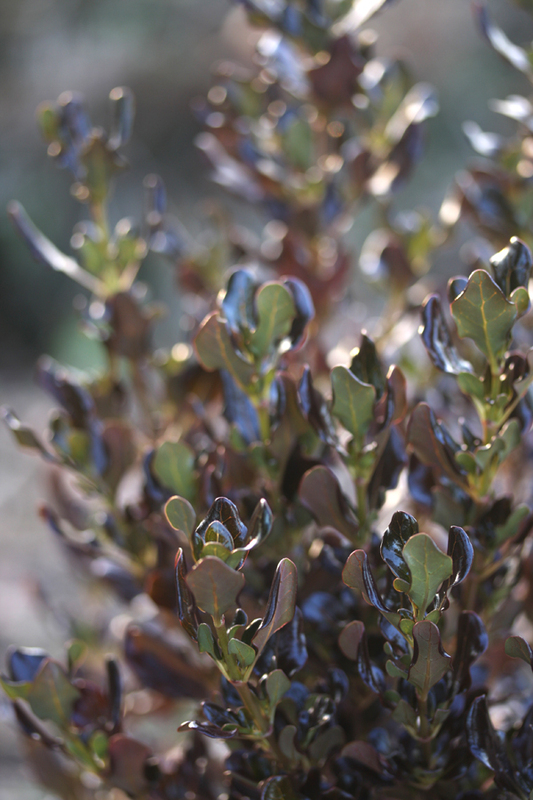 Coprosma seen here has the most unusual foliage, small evergreen leaves in a rich dark crinkly purple green. It does need a sheltered spot. In a border it adds a really interesting texture and a good frame work. It is a medium shrub final height if left to its maximum is about 1.5m. 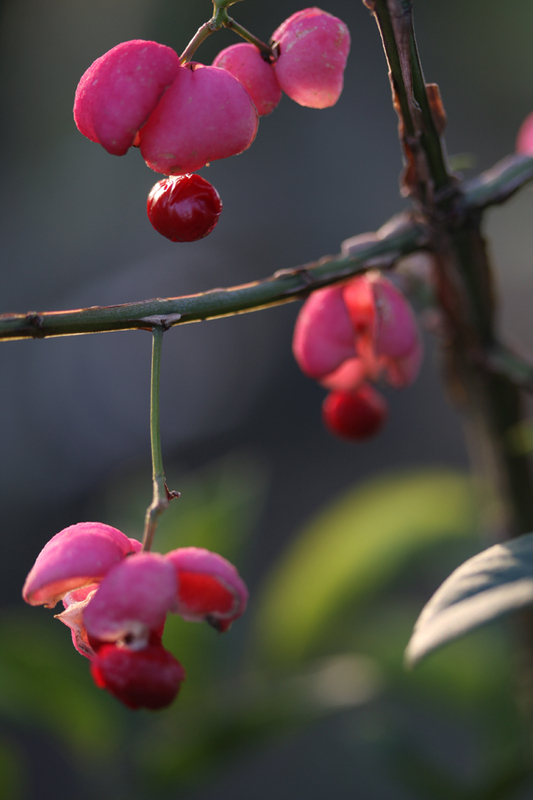 The spindle tree has fascinating fruits seen here on corky branches. Its a very hardy deciduous quiet large shrub and often has lovely autumn colour. We picked this summer flowering shrub out for its unusual pinkie again slightly crinkled foliage. It’s really pretty. Another large deciduous and uncomplicated shrub. This is a more compact variety of weigeila at 60cm with pink tubular flowers around April time. Part of a new series of compact hypericum at 1m x1m. Interesting yellow flowers with long stamens followed by striking scarlet berries. The pure single white flowers of these Japanese anemones provide a real lift to the garden in late summer. These have been selected for its glorious autumn foliage almost red flecks and absolutely beautiful with the afternoon sun behind it. 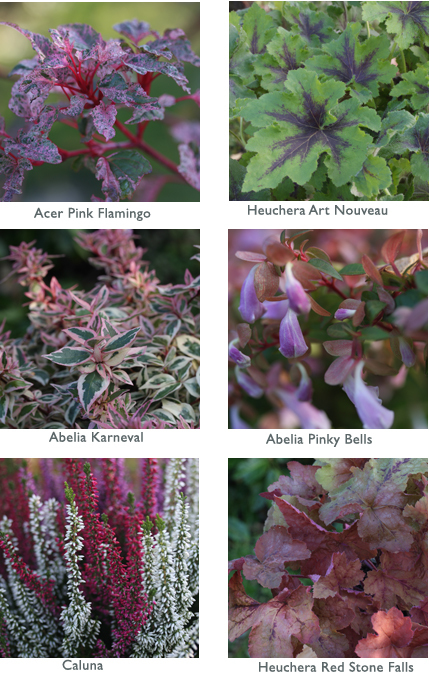 Leaves open light pink turning green with white and rich pink variegation which deepens to a fantastic flamingo almost red shades. Copes well in partial shade reach about 4m in height. When foliage is described as chocolate you just have to have it! 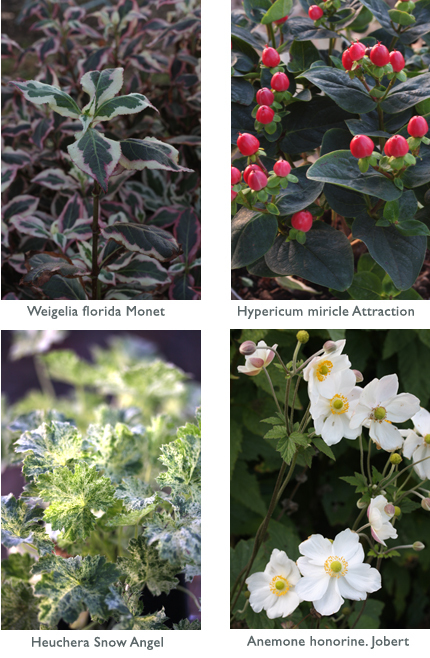 These striking colourful leaves really lift mixed planter and provide winter interest. 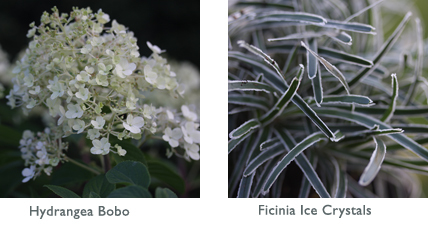 These are two more types of Abelia grandiflora with fabulous foliage. Pinky Bells noted for having the largest flowers of any abelia. They require a little shelter and well drained condition. These just sing with colour at the moment. They don’t like lime so keep them in an ericaceous compost. We have been using them in pots containers and basket with Pernettya a small evergreen berried shrub which also like lime free conditions. Enjoy the masses of huge beautiful white blooms on a dwarf shrub that will not swamp or flop in your garden. Tolerant to most soil. A new ornamental grass that’s got Christmas written all over it! Grow in a very well drained soil. This frosty foliage can make an amazing container plant when planted against red berries and other silver leaves such as the Heuchera Snow Angel above.